Hi all! It’s been too long since we’ve posted up a watch review on here, which is why we’re really excited to bring you another episode of #LookCloser, here on TheMatick.blog. Once again, with our friends from Mr. Jones Watches (MJW), we’re excited to bring to light one of their most recent creations, The Promise of Happiness. Before we dive right into it, for those who do not know, the story of Mr. Jones Watches began with British designer Crispin Jones. Dubbed “the Cult Watch Brand” from London, the company focuses on creatively designing conventional watches, by making them a little bit different from the rest. From time to time, MJW collaborates with designers to come up with creations which become extensions of the designer’s personality. With esteemed designers such as Clifford Richards for the Timewise, French artist Verre Églomisé, Marion Labbez for the Nuage, and British Tattoo Artist, Adrian Willard for the Last Laugh Tattoo Edition, it’s no wonder that MJW’s watches never fail to surprise. And so today, we’re going to be talking about The Promise of Happiness and its designer, Fanny Shorter. Without further ado, let’s dive right in. “…beauty is in the promise of happiness”. To put it simply, The Promise of Happiness is a wearable piece of art. It literally feels like wearing a painted miniature jungle scene on your wrist! The most intriguing aspect of The Promise of Happiness is the layers of art presented on the dial itself. The artist was able to skilfully blend all those layers, ultimately creating a surreal sense of depth and dimensionality. This in turn makes the watch a very interesting piece to gaze upon. It came to a point where I just didn’t care for time-telling. I just wanted to admire the dial. Fanny Shorter, the Artist behind the design. Fanny Shorter, wearing The Promise of Happiness. Fanny Shorter is a British designer and printmaker from Winchester, England. In a world where almost anything and everything goes out of fashion at some point, her work aims to produce items which are timeless. Growing up in Winchester, Fanny was inspired by the colourful prints, books, plates, rugs in her childhood home. The inspiration from which is clear in her work, being vibrant and full of colours! You can check out her website here. When it came to designing The Promise of Happiness, Fanny drew inspiration from artist Henri Rousseau, who was a painter from France. 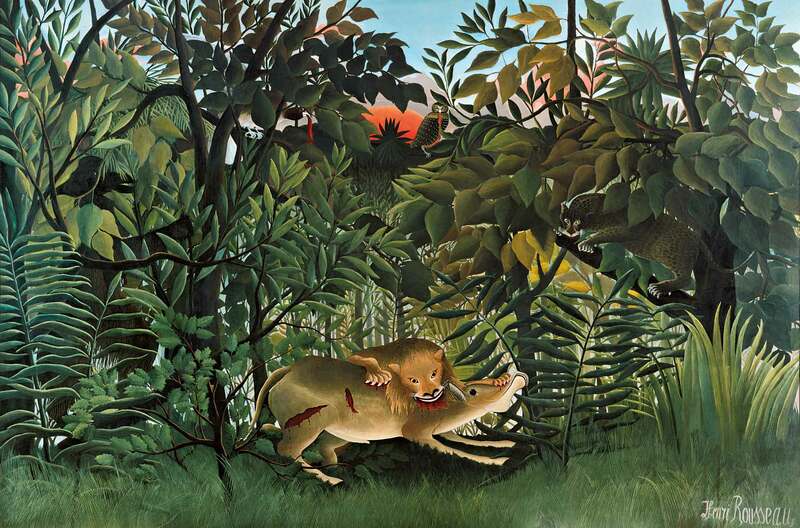 Rousseau came to be known as a self-taught genius whose works are of high artistic quality. 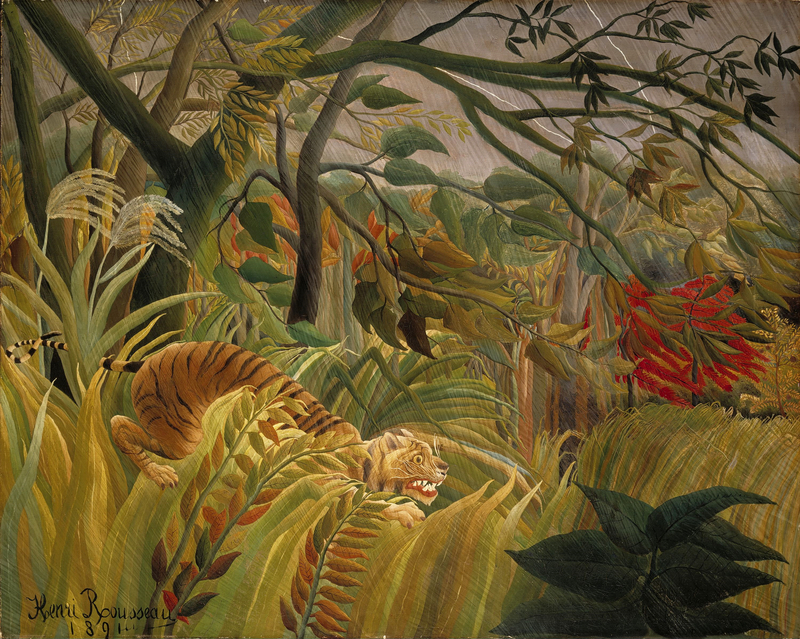 Throughout his career as an artist, he had painted a number of jungle scenes which inspired Fanny to come up with the artwork for The Promise of Happiness. 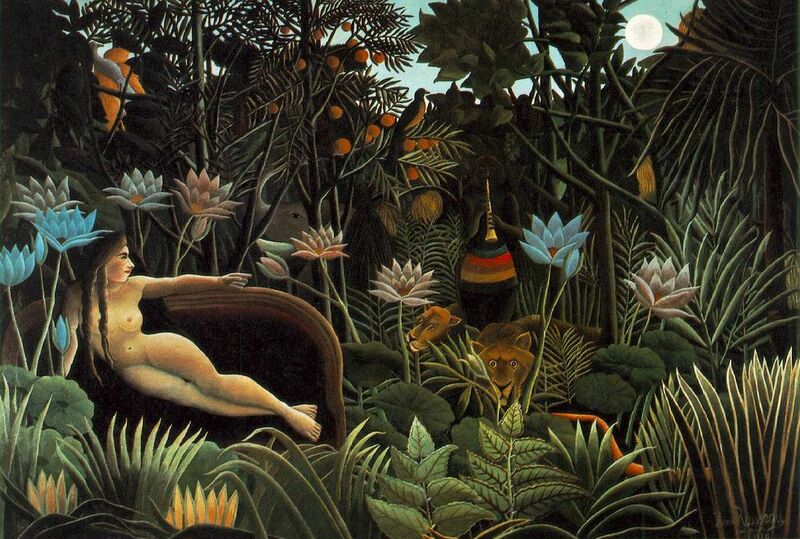 Here are some of the excellent works of art by Henri Rousseau, have a look. As you can see, Fanny took inspiration from some of the Rousseau’s artistic DNA and adapted it into a style that is very much her own. The Promise of Happiness alongside some concept art. The name of the watch was also inspired by a statement by Rousseau himself, “beauty is in the promise of happiness”. Not unlike the Motochrono reviewed previously here, each colour of the artwork is pad-printed layer by layer in MJW’s London Workshop. The pad printed background of the dial. The dial presents a prancing Tiger in the jungle gazing at the moon at night. An undoubtedly contemporary piece of design which reminds me of Shere Khan from the Jungle Book, to be honest! The Promise of Happiness is all about the DETAILS. It is to no surprise that everything about The Promise of Happiness, from the polishing of the case, to the choice of strap colour was deliberately chosen by the artist to bring the watch up to a balanced, well-blended finish. Every element is perfectly blended forming a harmonious piece of art. When our friends at MJW sent us the watch, I initially had a bit of trouble identifying where the minute indicators were. Upon closer inspection, you can find it cleverly hidden within the Tiger’s stripes. The Promise of Happiness close up. That to me is really cool, and a clever choice in design to keep the minutes somewhat unnoticeable. During watch events and/or gatherings, I’d often been asked by curious onlookers and watch aficionados on how to tell time on The Promise of Happiness. On many occasions, the watch was the star of the show, and definitely a great conversation starter. A true show stopper at the Jaeger LeCoultre Boutique Opening at The Pavilion, Kuala Lumpur. The watch received praise for its uniqueness in design from watch collectors who own watches costing many times more. This makes the Promise of Happiness an excellent Value Proposition, as Hodinkee would call it. Amongst the “Watch Rockstars” at the Jaeger LeCoultre event. I fell in love with the Promise of Happiness. It is one of the most interesting pieces we’ve ever seen here on TheMatick.blog. I’ve said this before, and I’ll say it again, if you’re looking for a watch to tell time quick and easy, get a Seiko or a Swatch. MJW does not make watches of that kind. MJW’s “canvas” lies within the walls of the watch dial, which is to say, the sky is the limit for what MJW (and their designers) can do. MJW is a perfect exemplification of the ethos that you don’t need to spend thousands of dollars to own an interesting or unique-looking piece. Standing out in an overcrowded market of ‘me-too’ watches, MJW makes watches with designs which look a million bucks, while still being accessible to everyone. Double-wristing The Promise of Happiness and The Last Laugh Tattoo Edition, because why not? The Promise of Happiness is a watch that is admired and praised by many, which makes us extremely proud to have had the opportunity to spend time with it and write this review. MJW has indeed done it again! We truly cannot wait for MJW to show us what’s in store next!